By 2042, whites will no longer be the American majority. As immigrant populations -- largely people of color -- increase in cities and suburbs, more and more whites are moving to small towns and exurban areas that are predominately, even extremely, white. Rich Benjamin calls these enclaves "Whitopias" (pronounced: "White-o-pias"). 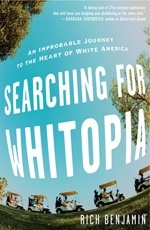 His journey to unlock the mysteries of Whitopias took him from a three-day white separatist retreat with links to Aryan Nations in North Idaho to the inner sanctum of George W. Bush's White House -- and many points in between. And to learn what makes Whitopias tick, and why and how they are growing, he lived in three of them (in Georgia, Idaho, and Utah) for several months apiece. A compelling raconteur, bon vivant, and scholar, Benjamin reveals what Whitopias are like and explores the urgent social and political implications of this startling phenomenon. The glow of Barack Obama's historic election cannot obscure the racial and economic segregation still vexing America. Obama's presidency has actually raised the stakes in a battle royale between two versions of America: one that is broadly comfortable with diversity yet residentially segregated (ObamaNation), and one that does not mind a little ethnic food or a few mariachi dancers -- as long as these trends do not overwhelm a white dominant culture (Whitopia).